Melissa Odabash launched her eponymous line of swimwear in 1999. A former model who lived and worked in Italy, Odabash knew what women wanted from their swimsuits and developed a collection made to flatter and enhance all body types. Dubbed by Vogue as the ?Ferrari of the bikini world,? Melissa Odabash two-piece bathing suits are classic and made to last. Whether you want a modest one-piece, a daring bikini, or a trendy high-waisted suit, the collection has a suit for you. Cover-ups worthy of a night out add a layer of style as you lounge poolside or protect from the sun at the beach. 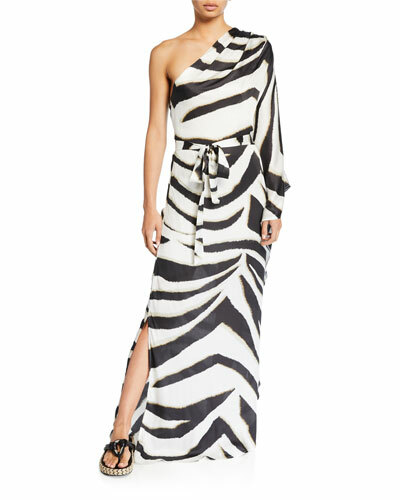 Shop a selection of Melissa Odabash bathing suits and cover-ups at Bergdorf Goodman. JETS by Jessika Allen "Jetset" one-piece swimsuit in solid microfiber. Sweetheart bandeau neckline. Crossover wrap-style front. Optional halter straps. High-cut sides lengthen legs. Full seat coverage. Self and lining, nylon/spandex. Made in Australia.